Are you tired of shuffling back and forth between windows to get your work done? Here’s a handy tool that lets you keep any window always on top when you need it. There are many ways to use multiple windows efficiently, but sometimes it seems you need to keep a smaller one in front of a larger window and they never quite fit right. Whether you’re trying to use Calculator and a web form at the same time, or see what music is playing while you’re catching up on your news, there’s many scenarios where it can be useful to keep one window always on top. There are many utilities to do this, but they are often needlessly complicated and bloated. Here we look at a better solution from Amit, our friend at Digital Inspiration. Thanks to AutoHotkey, you can easily always keep any window on top of all the others on your screen. You can download this as a small exe and run it directly, or can create it with a simple script in AutoHotkey. For simplicity, we simply downloaded the application and ran it directly. To do this, download Always on Top (link below), and unzip the file. Once you’ve launched it, simply select the window you want to keep on top and press Ctrl+Space. This program will now stay in front, even when it is not the active window. 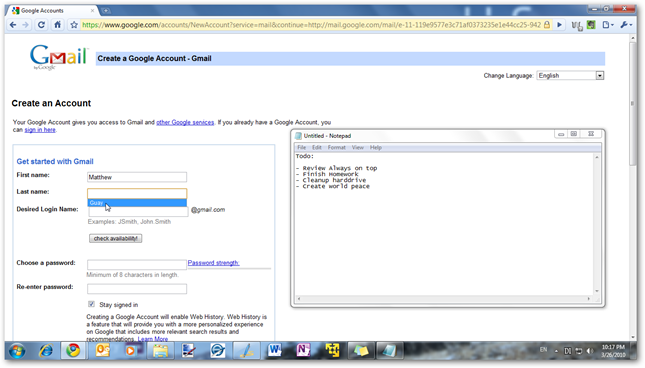 Here’s a screenshot of a Hotmail signup dialog in Chrome with Notepad kept on top. Notice Notepad isn’t the active application, but it is still on top. If you wish to un-pin the window from being on top, simply select the window and press Ctrl+space again. You can keep multiple windows pinned at once, too, though you may clutter your desktop quickly! 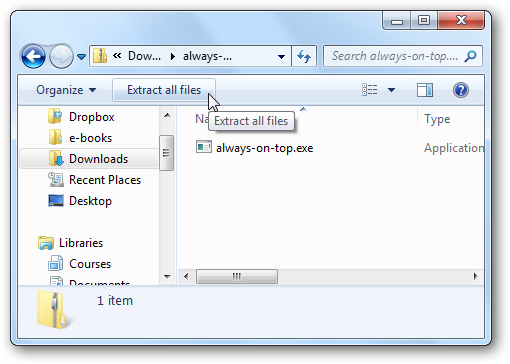 Always on Top will keep running in your system tray, and you can exit or suspend it by right-clicking on its tray icon and selecting exit or suspend, respectively. Simply create a new file, insert the code, and save it as plaintext with the .ahk file extension. If you have AutoHotkey installed, simply double-click this file for the exact same functionality as the premade version. This is a great way to keep a window handy, and it can be beneficial in many scenarios. For instance you can use it to copy data from a PDF or image into a form or spreadsheet, and it saves a lot of clicks and time.